Full Face Recognition Face Forensics (f2) is a highly advanced face recognition system that is designed to work with the embedded or linked face images in your existing database, be it SQL Server, Oracle, or DB2. Once f2 is pointed at the images it will analyze the characteristics of each one. These are used to generate a unique digital encoding describing each face. These encodings are stored in a separate database, or matching gallery. Once all the faces have been enrolled, any new face can be enrolled and matched against those in the matching gallery. Matching galleries can be shared amongst f2 users, so multiple users can connect to a single gallery. Users can connect to any computer running an f2 gallery of interest. Because searches are comparing encodings describing faces rather than the images themselves, the searches are extremely fast, typically greater than 1m records/second. f2 can optimize itself for the specific type of image it’s being used to recognize. f2 is unaffected by race, age, or colour. 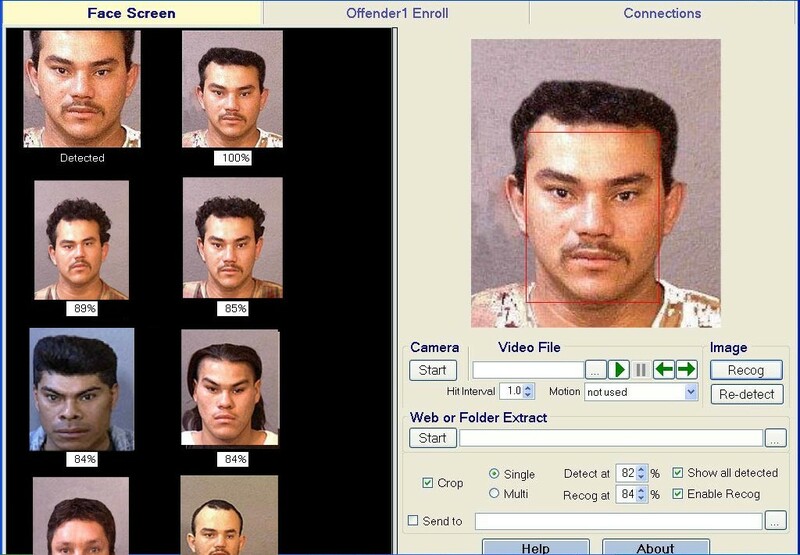 Interactive Investigations: f2 can enroll the faces of unidentified people, allowing an officer to recognize them by matching the unknown face against different facial databases. In this case any image in the database that matches above a predefined threshold will be displayed. The officer then visually confirms whether it’s the same person or not. Interactive Checkpoint Security: f2 can be used to assist a security officer by continually screening a flow of persons passing through a checkpoint. Recognition matches against a watch list will be displayed in real-time, allowing the security officer to quickly review the matched images. Forensics - Partial Face Recognition: f2 has the unique ability to match part of a face against a database of faces. This is useful where only body parts are left, e.g. after an explosion, or when only part of a picture is available. The image of the facial part is positioned on a facial template. Controls are available to resize the partial face as well as adjust the key characteristics of the template to the partial face. Once positioned as well as possible, the partial face is encoded. This encoding is then matched against the same parts of full faces in the database. Matches above a predefined threshold are displayed for an investigator to review . Automated Criminal/Missing Person Investigation: f2 can connect to and enroll a gallery of mugshots of missing persons, allowing an f2 machine to continually search suspect web sites and their associated links for matches against the enrolled gallery. Matches exceeding a user-defined threshold can be sent to a folder either locally or on the network. f2 can also automatically search hard drives for detections and matches. Automated Identity Verification: f2 can confirm that the photo in an ID document such as a passport or driver’s license is of the same person as the individual presenting it. Automated Alert Security: f2 can screen real-time video to monitor an area. The detection and/or recognition results can be e-mailed in real-time to security staff carrying hand held computing devices. Automated Duplicate Applicant Search: f2 can search for duplicate entitlement document applications under different names, e.g. for Driver's Licenses or Social Security cards.